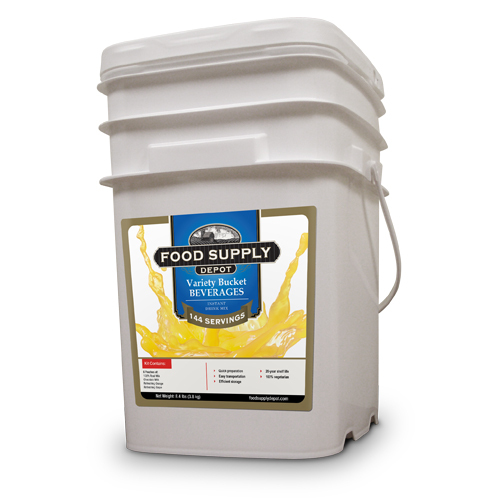 Beverage Variety Bucket Our Beverage Variety Bucket provides 15,120 calories filled with four options for quenching thirst. When fresh milk is not readily available, you now have an alternative ... 100% Real Milk or Chocolate Milk. When needing a refreshing drink, FSD has two flavors to choose from - orange or grape. Along with providing vitamin C, they both complement all our entr?????es. Just add water, and in seconds, you can enjoy your choice of drink anytime or anywhere. Features: 100% Real Milk: 6 individual pouches totaling 2400 calories. Chocolate Milk: 6 individual pouches totaling 4080 calories. Refreshing Grape: 6 individual pouches totaling 4320 calories. Refreshing Orange: 6 individual pouches totaling 4320 calories. Individually packaged in family-sized pouches (approx. 2 adults/ 2 children). 3-ply mylar pouches have the sealing power to keep freshness in and the pests out. Oxygen extraction procedure that further protects nutrition and taste. Easy, re-sealable lids that allow opening and closing without unnecessarily exposing the other pouches to air. Convenient handles and sensible weight for easy transportation. Innovative interlocking bucket design that makes stacking easy and stable.